Why is this not diagonally symmetric? 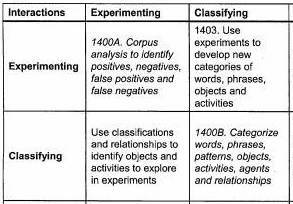 What's the distinction between (Experimenting, Classifying) and (Classifying, Experimenting)? Suppose you are trying to experiment with classes of words that indicate transfer of liquids, like “leak”, “flow”, “slosh”, “pour” and so forth. You would like to organize those liquid-transfer verbs into subclasses which work well with a specific corpus. In cell 1400B (the diagonal), the goal is to categorize the verbs by semantic meaning, by the signatures of syntactic forms in which they occur, and/or by correlations of each instantiated verb’s meaning (assigned by the interpreter) and its designated subjects, objects and adverbs. The Experimenting diagonal cell 1400A indicates that the goal is to identify sentences in which the instantiated verb is/isn’t used in accord with the classification of liquid-transfer verbs from 1400B. Perhaps you want to write an English interpreter (an English Logic Kernel – ELK) for a specific corpus. You develop a procedure(s) for each sentence that interprets each verb, and a procedure(s) for each word, phrase, sentence, object, modifier and other parts of speech that you can consider consistent with the meaning of the corpus. This approach helps organize your discovery processes and form them into a managed project leading to a planned result. That document explains in deeper detail, though it is intended for an audience of programmers and linguists, implementers of the ideas described there.